I agree with David Meerman Scott most white papers are pretty lame. I think if most companies looked at analytics for these they’d see few actually reading what they poured hours of work into. 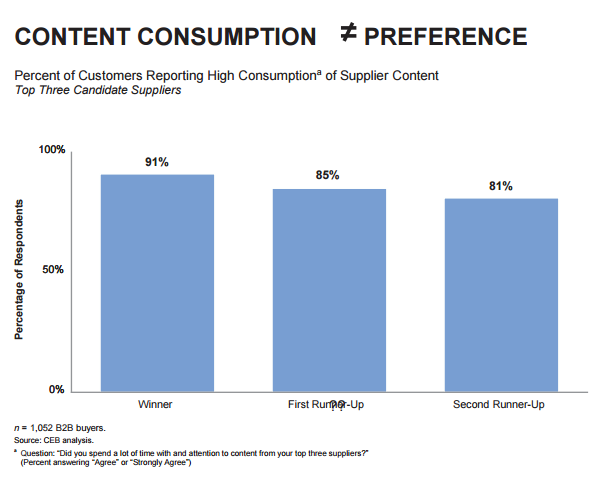 The content is too generic and too unfocused on the buyer’s needs. Research has shown that building content and service bundles that align with the buyer’s journey is a very effective way to encapsulate your company’s knowledge into pieces the customers are craving. A form of white paper alternative is the “answer-gift” delivered in reaction to a customer question or perhaps a known pain-point. Think of it as a FAQ “bonus” page, or a “cheat sheet” designed to become a resource for a particular stakeholder at a particular time in their buyer’s journey. This often works best for B2B clients where sales cycles are longish, but I’m even proposing it for retail clients where the decision between products is a bit complex. In addition, these “FAQ-like” content bundles can made to work very well in Google Direct Answers. The sales guys use these as add-ons to their usual communications – and many pre-sales communications are accompanied by “gifts” of knowledge added to the email, left on their desk, etc. This a minimally branded, printer-friendly document designed specifically to solve a customer’s pressure. Some are designed for technical staff and others for executives. Visualize a library of 2-4 page add-ins in a library everyone can use, but in a very well-planned fashion. This bundling of need-to-content also reduces noise levels and improves perception of your company’s helpfulness. 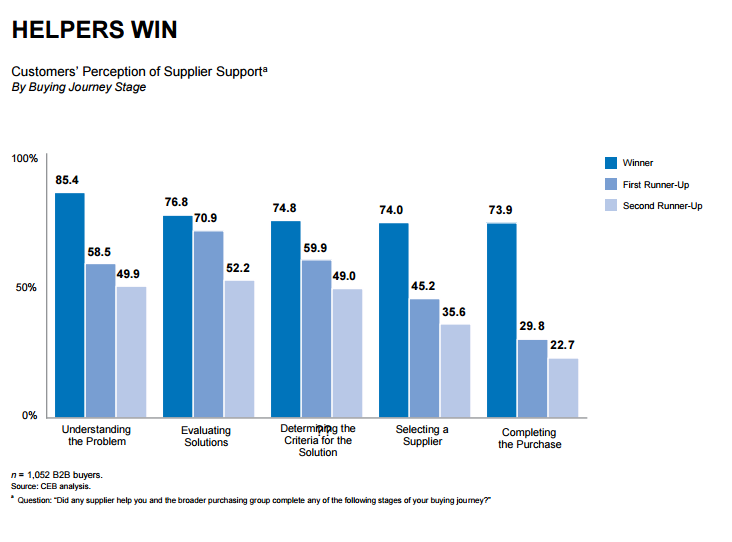 Being aware of needs, and helpful in all phases of the buyer journey a proven way to win among strong shortlist competitors. For a client who installs food laboratory equipment, for example, we knew the pain point was in making sure clean, well-routed electricity is available for the stuff they’re installing – so we created a minimally branded 3-page guide to preparing the location for different types of lab equipment. “Wow, where’d you find this?” is the desired reaction…and printed versions on the decision maker’s desk is one excellent outcome. If you achieve this, it puts you in an authoritative role in the sales cycle …as prospects inevitably call with “more questions” giving you a chance to shine – and hopefully arrange a visit. Sometimes we even prompt this by saying “Call Sam Smith for specific information about…” and give a direct line. Smith then answers the questions – sometimes with another gift – putting them miles ahead of the “brochure and handshake” competition. Should these cheat sheets be public? This depends on where you need them. Often, these sheets are excellent SEO link bait – so you may want to put SEO optimized versions of them on the website and go for external links. But this should probably be a subset, or a specially crafted version for link purposes. Your situation may vary on this. I think some gifts should be free and others held back as engagement fuel. So far, most of my clients want to keep them out of public view – but we’re working towards two sets – a public set, optimized for a common phrase and a private set, optimized for gifting. A major obstacle to the deployment of this idea is staff’s lack of understanding of the program. New sales people need full training on the material – and ask a senior person when to use which part. What happens often is that the salesperson just starts attaching everything to their first follow up, killing the program – and taking you back to square one. You must only send what directly addresses the customers’ needs – and you must draw attention to the material in your responses. Otherwise, you have a muddle of noise that does little to advance your authority. I’ve been working on ideas that support the sales process – color coding the material by sales stage, persona of recipient, etc, to avoid spewing things at the wrong time. It’s not easy to generalize and unproductive to overly formalize – so everyone needs to identify the right material for the right time. I’m even hoping to do some paid search experiments that guide the creation of new content. It’s an art designing this library of gifts – how it’s staged and to whom it’s delivered when. You need to create a flow chart of your sales cycle and see where / when they are added to the mix – everyone will be slightly different and development will be organic. Scenario and persona analysis can help you create archetypes to guide you – or specific customers might give you what you need to build them. I agree fully. I think that a lot of companies view “white papers” as a way to generate a lead. It’s usually seldom used, people are skeptical in “registering” to download them and the overall value is negligible. I would say that a better way is to create a true “resource” section with important reference info. This provides a sincere service, encourages return visitors and builds trust with your online communty. When site owners take a sincere interest in helping others the good things will follow.